As an engineer I am often asked to know what is going to happen before it even happens. Whether I like it or not, predicting the future is in my job description. Every new product needs to work for at least as long as it is under warranty. If the product fails before the warranty is up, the company is financially responsible, which ultimately points back to me. Being a domain expert gives me the final approval regardless who did the design work. It also makes me responsible for everything that touches my desk. Fortunately, I can rely on the hard work of other people to make this easier than it appears. The first step to figuring out how long a product will last is understanding what is the likely failure mode. This will vary from product to product, but in my case this is typically electrolytic capacitors in power supplies and LED drivers. Size constraints force the heat emitting LEDs to be in close proximity to temperature sensitive capacitors. These capacitors are necessary to provide regulated power but also have a well documented failure mode. 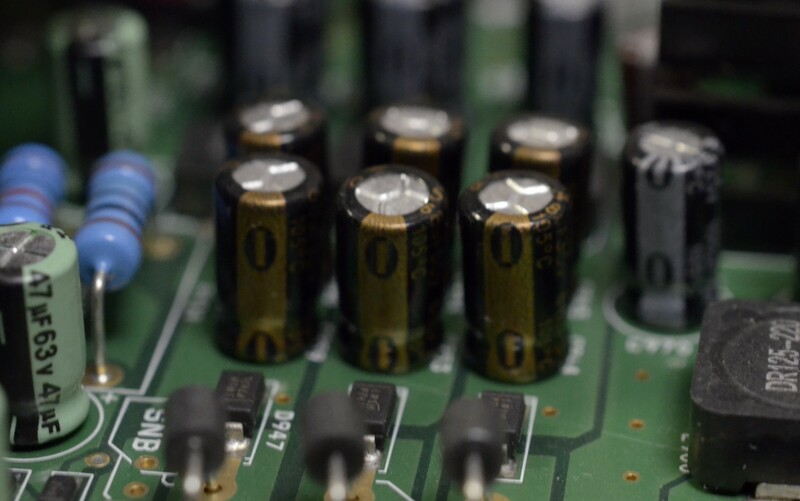 The dielectric material that allows the capacitor to store energy deteriorates over time. This causes a steady loss of capacitance based on a few factors such as operation time and temperature. Like most simulations, the formula can get complex if you include every parameter. In practical application, rules of thumb and simplified version are more common because they save time. Since it is a bad idea to have the calculated life exactly the same as the desired life, safety margins are added. These can cover up errors in simplified equations making them even more useful. I can’t explain the years of chemistry and testing that went into the above equation. I can tell you that your capacitor will fail around L hours of operation, in ambient temperature Ta, with an endurance rating of L0 hours, at Tmax temperature rating. The only user defined parameter is Ta. The other two come from the capacitor specification sheet. Since I am often evaluating other people’s products in my system, the capacitor is already chosen. The only thing is care about is that the capacitor life doubles for every 10C drop in ambient temperature. 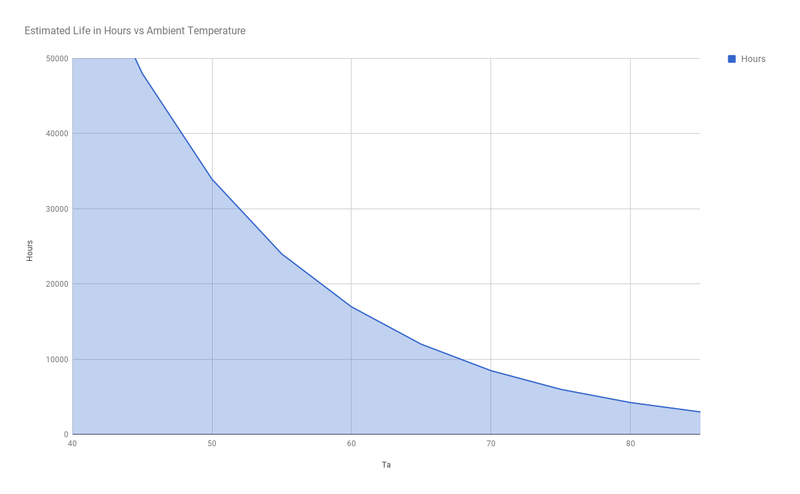 If I need to get to 50k hours of operation and my current design is only getting 25k hours, I will need to reduce my capacitor temperature by at least 10° C.
The capacitor life doubles for every 10°C drop in ambient temperature. When I am not already given a lifetime, I need to find it on the data sheet. For this example I grabbed a random capacitor out of my parts bin. I was able to find the datasheet by looking at the text printed on the side of the part. The model number is REA and the temperature rating is 85°C (Tmax). Most capacitors manufacturers use a three letter part model number so I guess correctly by ignoring the H136(M). After finding the datasheet I went to the endurance section. There are two different L0 numbers listed. This has to do with the physical size of the capacitor. My part is around 10mm so it has a L0 of 3,000 hrs. Now that I have all the numbers I need, I can enter those into the formula to find out what my ambient temperature needs to be to hit a reliability of 50k hrs. Since I am testing multiple components to get the right fit, I make spreadsheets to keep track. The chart below shows that I would need a Ta of ~45C to get to 50k hrs. If I couldn’t get my design to operate at 45C, then I would need a capacitor with a longer endurance or higher temperature. The LED drivers I deal with use 105C capacitors, rather than 85C, for this purpose. With a 3,000 hr at 105°C capacitor, I can operate at ~65C and still get 50k hrs of expected life. If you would like to try this out yourself, you can find my spreadsheet here. If I wanted to further reduce the risk associated with my design, I could setup an accelerated life test. Using the 10C rule of thumb and an elevated ambient chamber, I can force failure in a much shorter time span. An elevated ambient chamber is basically a fancy way to say oven. It uses a heating element to raise the temperature to a specific set point. It could be a expensive commercial device or a toaster oven with a good controller. The professional units are usually large, accurate, and include humidity controls but I have seen many different DIY solutions. Once I pick a chamber, I need decide what temperature to set to and how long I need to run it. Sticking with the capacitor shown above, I can’t exceed 85C without going over the max rating. I can take it up to 80C and still have some room for my chamber to safety overshoot a bit. This would drop my expected life from 50k hr to less than 5k hours. I can increase the confidence my system will last 5 years at 45C by only testing for 6 months at 80C. Even if I can’t wait 6 months to release the product, I still can discover problems because they become customer problems. This may end up in a recall or re-design, but it is cheaper to do that with 6 months of products sold rather than 5 years. These equations are a nice tool to have, but they aren’t perfect. No one can’t predict the future with 100% certainty. There will be times when the equation doesn’t work. The manufacturer may make a bad batch, the device will get get damaged in shipping, or a lightning strike send a voltage spike across the leads. All of these test procedures are design to reduce failure to an acceptable level rather than eliminate them all together. The standard failure rate varies but it is never zero. Luckily good enough is still good.